The holidays are here, and the food fest has begun! I have company in and out throughout Christmas and the New Year almost constantly. With such big meals being served and decadent desserts around the house at all times, I like to welcome my guests with an hors d’oeuvre that is light, yet elegant. 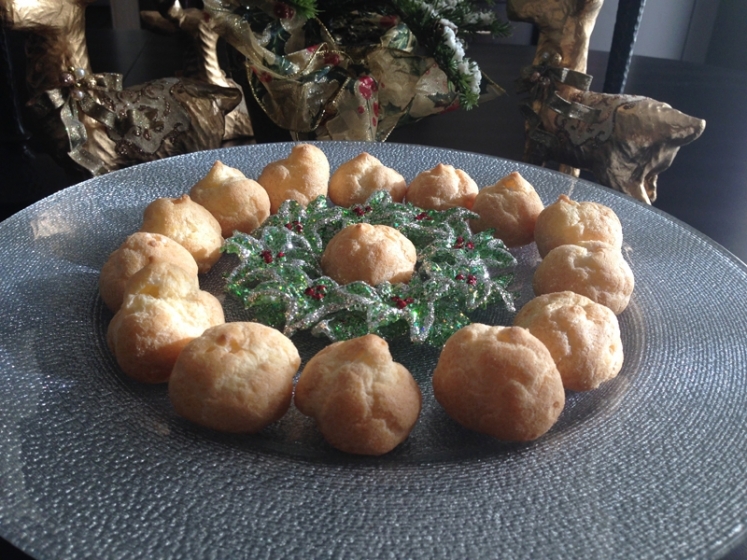 For me, nothing is a celebratory as a glass of champagne accompanied by these light and melt-in-your mouth Gougeres (cheese puffs). Make them ahead of time and freeze them, and you have a wonderful hors d’oeuvre at a moment’s notice. Happy Holidays…see you in the New Year! In a small saucepan, bring the milk, butter and salt to a boil over high heat. Add the flour, and immediately turn the heat to medium low and whisk vigorously. The dough will begin to form and pull away from the pan. Keep whisking for another minute until the flour has cooked, and the mixture smells slightly nutty. Remove the pan from the heat, and pour the mixture into the bowl of an electric mixer. Let it cool for about five minutes. Using a paddle attachment mix the dough on medium high speed, adding one egg at a time. Be sure that each egg is incorporated before adding the next. By the time all five eggs have been added the dough should be smooth and shiny. Turn the mixer to a low speed and add the cheese. Mix only until the cheese is incorporated, and then stop the mixer. Drop one tablespoon of dough onto the cookie sheet (or use a piping bag to make the gougere look especially pretty). Be sure to leave approximately two inches between each one. Place the gougere in a 375 degree oven bake for 15-17 minutes (until golden). The Elegant Occasion Note: The gougere can be made in advance. Simply place the uncooked gougere on cookie sheets in the freezer for two hours until frozen. Remove them from the cookie sheets to a freezer bag. The gougere will keep for one month. When ready to cook, simply take them from the freezer, place them on a parchment lined cookie sheet, and cook as noted above. For herb gougere, simply add one teaspoon of Herb de’ Provence, thyme or rosemary to the dough when it is in the mixer. 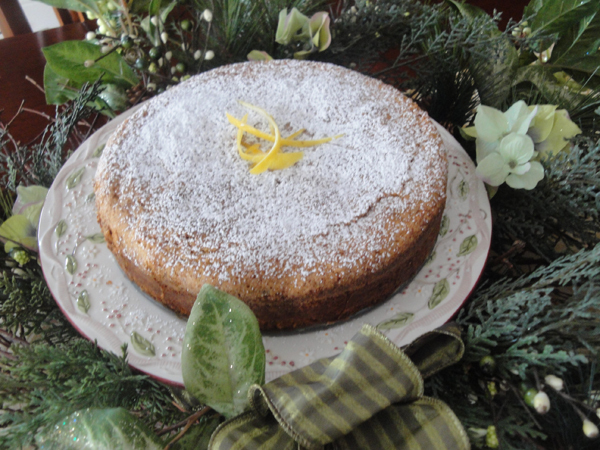 I have fond memories of being a small child sitting at my aunt’s table and eating warm Polenta Cake. We ate a lot of polenta growing up….sometimes it was creamy polenta with meat sauce, sometimes it was fried polenta and then of course, there was the cake. Richly scented with vanilla and lemon, this cake is truly a satisfying dessert after a comforting dinner. It does not need much garnish, but if you like you can serve it with some vanilla gelato. Eat this cake warm for dessert, or reheat it the next day and have it for breakfast with a good strong cup of coffee. PS: If you like nuts, try adding 2/3 cup of toasted hazelnuts to the batter. Grease and flour an 8-inch round cake pan. In a small bowl, stir the flour, cornmeal, baking powder and salt and set aside. Place the butter and vanilla bean paste in the bowl of an electric mixer (if you do not have vanilla bean paste, you can scrape out the inside of 2 vanilla beans, but vanilla bean paste is much easier). With a paddle attachment beat the butter and vanilla until pale and fluffy. Add the sugar and continue to beat for 3 minutes. Add the eggs, lemon juice, zest and sour cream and mix again. Finally, add the flour mixture and beat until just combined. Pour the batter into the prepared pan and bake until a toothpick inserted into the center comes out clean (about 45 minutes). Transfer the cake to a wire rack and let it cool for 15 minutes before inverting onto a plate. Dust with confectionary sugar and curled lemon zest and serve. The Elegant Occasion Note: This cake is best eaten within 24 hours. It’s that time of year…when I get my apron on at the crack of dawn and start baking Christmas cookies. I usually bake ten to fifteen different kinds of Christmas cookies starting in the beginning of December and then freeze them as I go along. A week before Christmas, when I am ready to give cookie trays as gifts, the cookies are waiting for me. These Molasses Bar Cookies are perfect for the season! The molasses, ginger, cinnamon and clove will fill your home with a wonderful fragrance as they bake. Growing up, my favorite aunt made a version of these that I just loved. 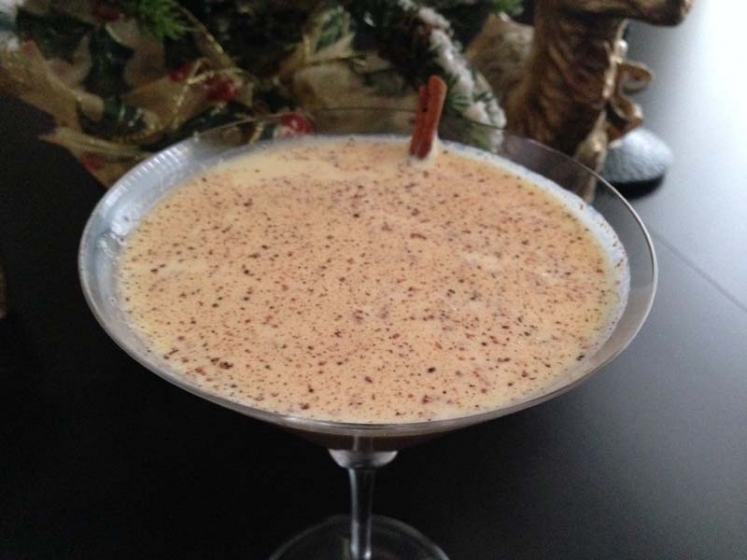 I never got her recipe, but this one tastes pretty close to what I remember. The glaze on top is a nice touch to dress them up and helps them hold their moisture. Bake these now, cut them into bars and freeze them between layers of wax paper in an airtight container. PS: The best part about these cookies is that you just add all the ingredients in the bowl and mix. But be careful not to over mix or your cookie will be dry. Place all ingredients accept the currants in the bowl of an electric mixer and combine using a paddle attachment. When the cookie dough has come together stir in the currants. Line a 9×13 baking sheet with parchment. Pour the mixture onto the cookie sheet and spread evenly. Place in a 350 degree oven for 20 minutes. The cookies are done when a toothpick inserted into the sheet pan comes out clean. Stir the ingredients together in a bowl. If the icing is too thick, add a touch more milk. When the cookies have cooled for 15 minutes, pour the icing over the entire pan and spread evenly. Sprinkle the chopped ginger and currants over the freshly spread icing and allow icing to dry completely before cutting. The Elegant Occasion Note: These bars will last for weeks if you freeze them in an airtight container in between sheets of wax paper. Karios68 - Праздники и события, которые мы отмечаем, чаще всего не проходят без цветов. Цветы оставляют впечатляющие воспоминания о каждой дате. У любого человека имеется цветок, ему он отдаёт предпочтение из общего разнообразия. У нас в широком цветочном ассортименте вы найдете цветы на самый изысканный вкус. Если вы не уверены в точных предпочтениях человека, которому хотите купить цветы, можете остановиться на красивейших букетах. Наши букеты сделаны профессиональными флористами. Букет из алых роз, нежных орхидей, прекрасных хризантем и других, поражающих своей красотой цветов, будет хорошим презентом, как даме, так и джентльмену. Если вы хотите доставить радость девушке, то купите к букетук примеру мягкую игрушку. Такой сюрприз будет по душе любой представительнице женского пола. Розы являются самыми покупаемыми цветами. Даря эти цветы, вы наверняка угодите любому человеку. Эти красивые цветы имеют неповторимый аромат, который может радовать длительное время. У нас на складе в наличии огромный выбор сортов роз различной длины и цветовой гаммы. Cut bread into small cubes and toast under the broiler until golden brown. This only takes seconds on each side, so keep a close eye on the bread. Place the bread cubes in a large bowl. Place the macadamia nuts in a large sauté pan and gently toast until the nuts smell fragrant. Place the butter in the pan with the nuts and melt. Add celery, shallots, sage, poultry seasoning and salt and sauté for 3-5 minutes until softened. Pour the mixture directly over the bread cubes and toss well. Pour 1 cup of the chicken stock over the stuffing and toss again. Add more stock as needed so that the dressing is moist. If you are stuffing the turkey you want to add a bit less stock since the turkey will add moisture to the stuffing. However, if you are cooking the stuffing separately, you will want to add more. Transfer dressing to a buttered baking dish and bake covered for 35 minutes at 325. Remove cover and bake for an additional 10 -15minutes at 350, which will allow the top of the stuffing to crisp.